Navy photographer Eric C. Burgett pays homage to a classic 1949 Life magazine photoseries in this gorgeous shot of an MV-22 Osprey taking off from the Navy’s amphibious assault ship USS Boxer. 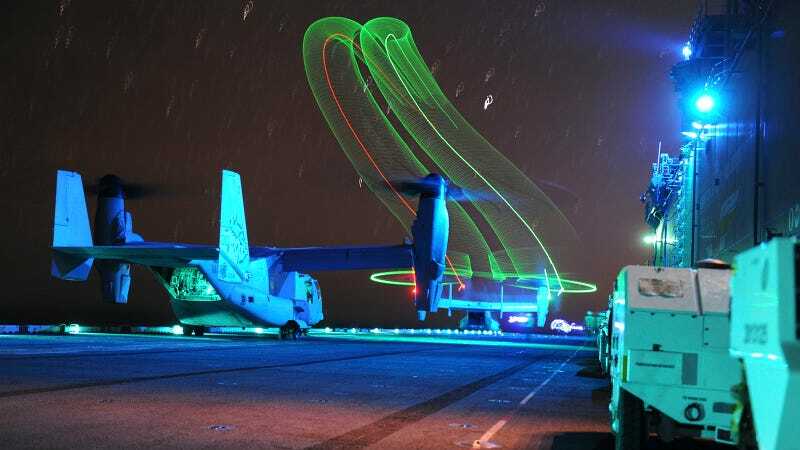 The Slinky-like light pattern was produced by a time-exposure of the light-tipped rotor blades of a grounded helicopter as it took off back in 1949. Seaman Burgett employed a similar light-painting technique over six decades later to create his own eye-popping—and slightly more colorful—coiled pattern.